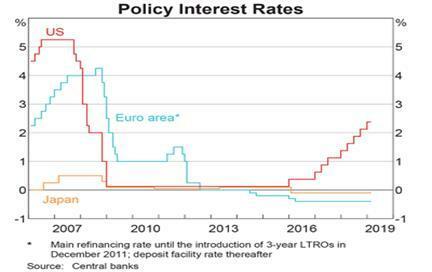 It is our view that the maintenance of negative rates of interest across both Europe and Japan with no positive economic result, is an act of economic insanity. Further the continuation of quantitative easing for nearly 8 years (in Europe) and over 15 years (in Japan) with no discernible economic benefit are also acts of economic madness. The central bankers and bureaucrats of Europe and Japan are bereft of new ideas that will stimulate their economies. In our view they seem totally deluded in the belief that they are doing a good job. Rather they are seemingly repeating the same mistakes. Their policies have previously and once again taken their economies towards stagnation. Today they have no more ammunition – short of printing money and giving it to the public - to stimulate economic activity and business confidence. The purchase and the holdings of government bonds have ballooned. 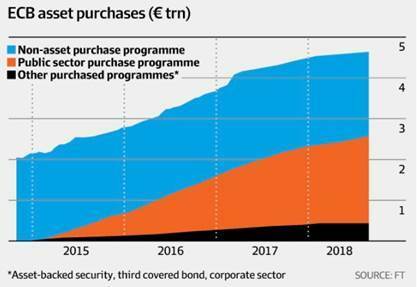 Across most of the individual economies in the Eurozone the ECB holds over 20% of all bonds on issue and in reviewing the purchases, there seems to be little logic to the process. For instance, the acquisition of German bonds seems inconsistent with the need to finance the German government given its fiscal position is very strong. 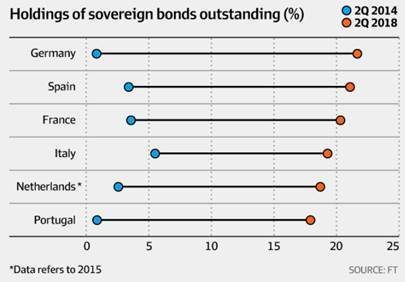 So why is the ECB holding of German bonds the same as for Italy or Portugal, which are economies in a fiscal mess? It seems that the Germans, who effectively run the ECB, believe that the likes of Italy or Portugal should receive no preferential treatment, even if they are in dire need and Germany is not! 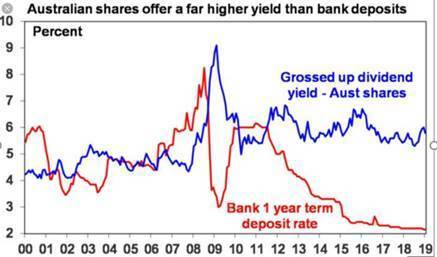 The negative cash rates do stimulate demand for government bonds as banks in particular seek yield from other sources. The maintenance of negative cash yields combined with QE has pushed government bond yields into negative territory and so the banks are stymied here as well. No wonder the profits of the European banks is dreadful and the two largest German banks (Deutsche Bank and Commerzbank) are now trying to merge to drive costs down. 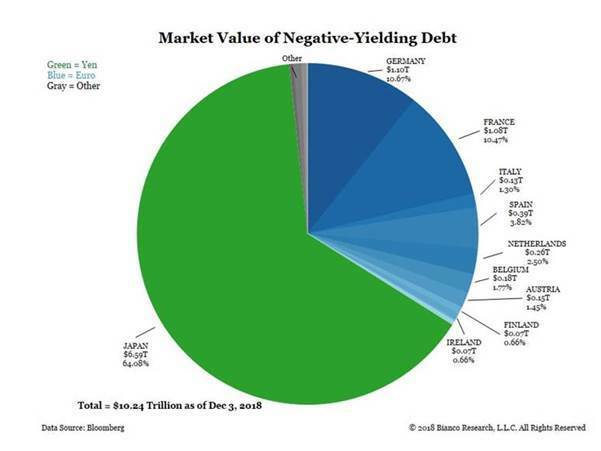 Our next chart (as at December 2018) tracks the amount of government bonds that trade in markets with negative yields. It shows that at that time 64% of all Japanese bonds on issue had a negative yield - even though Japanese ten year bonds were yielding a positive return. Since December, Japanese ten year bonds have fallen below a zero yield and the percentage of negative yielding bonds has lurched higher towards 70%. The cost to the economies and the investors of Europe and Japan is immense. It is the savers and providers of capital that suffer most. The destruction of the capital of pension funds must surely be a hidden time bomb. How can pension funds that generate little or no return meet the liabilities of an ageing population? How significant is the pension shortfall across Europe and Japan? We can only wonder. But if there is a grand covert plan to recapitalise Europe and Japan through QE - it could be this. The central banks buy all of the government debt on issue and then write it off or roll it into 100 year bonds. The debt will never be repaid and effectively disappears! There is no other logical explanation for what is happening in Europe and Japan – other than insanity! 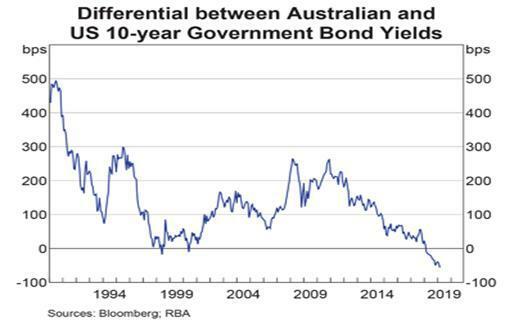 There is no doubt that the declining and manipulated bond yields of Europe and Japan directly influence the bond yields in the US and therefore Australia. 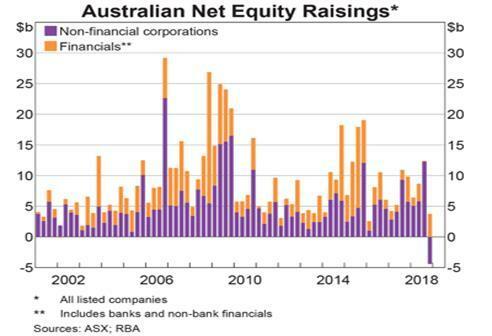 However over recent months the interplay between US and Australian bonds has passed through a significant and historic point. As can be seen from the chart below, the Australian ten year bond has dipped below the US bond yield and has continued to do so. 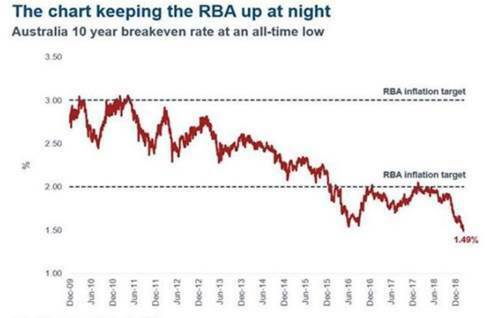 The Australian bond yield lurched lower this week to a record low that is now 0.25% below the RBA targeted rate of inflation. Thus ten year bonds are close to having a negative “real” yield. Low investment returns on savings and cash deposits in SMSFs is having an effect on the savings ratio. 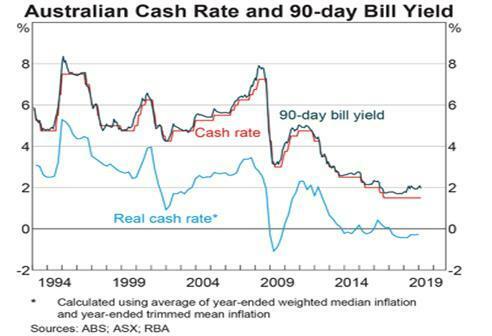 These negative influences have added to stagnant wages growth (below inflation) and the rising cost of basic public services to push Australia’s savings rate down. 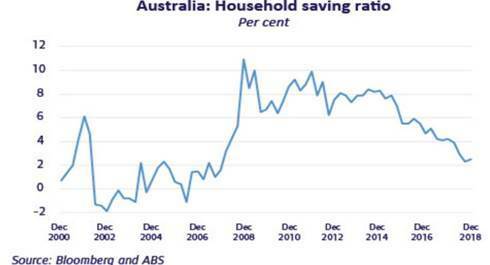 Normally a declining savings ratio indicates growing consumption and consumer confidence – but not this time. It remains a difficult climate for investing. SMSFs must remain disciplined and diversified. They should not be driven by greed to chase excessive returns that are high risk. Not in a world driven by insane monetary management. Welcome to the Hotel California Such a lovely place (Such a lovely place) "Relax," said the night man "We are programmed to receive You can check-out any time you like But you can never leave!" Hard assets are going to be very lovely in the years to come. Terrific observations John. You have hit the nail on the head IMO. 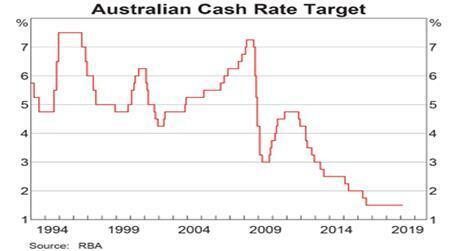 1) The flip side of the trickle down wealth effect (which was supposed to pump-prime western economies) is that with low rates savers spend less (income on $1m invested at 5% was $50k pa but at 2% is now $20k pa) and the economy contracts. 2) Savers approaching retirement see they need higher investible balances to yield a living, so save more (spend less) and the economy contracts. 3) Corporates see falling /sluggish demand and buyback shares instead of reinvesting in growth activities, so the economy contracts. 4) those with ample assets who benefit from asset price inflation do not change their spending habits (no need to) so there is no benefit to the real economy. Net net, the economy slows, the trickle down effect did not seem to work. My questions are, will we get continued synchronized slow down in the global economy, and if/when we get CBs writing off Govt debt in Japan, Europe and US, will we get uncontrolled inflation (smaller real economy and vastly higher money supply). Thank you. Very valid observations and inferences. Central banks are trying to improve the availability of credit, but with demand not improving businesses finding it hard to invest. The inaction of Governments to create demand, especially through the middle-class, is the issue. Finally some sensible commentary on monetary madness. Developed economies are in a period of secular disinflation and stagnation close to (or beyond) the zero bound for interest rates. The 'elephant in the room' solution is so-called QE for the people a.k.a. helicopter money. Higher nominal GDP will allow slightly higher (i.e. sane) interest rates, in the given conditions a small dose helicopter money is the best way to get us there. Why do you think the Russians are buying Gold? Maybe it's time to invest directly into Gold or at least into Gold producing companies. What do you think?